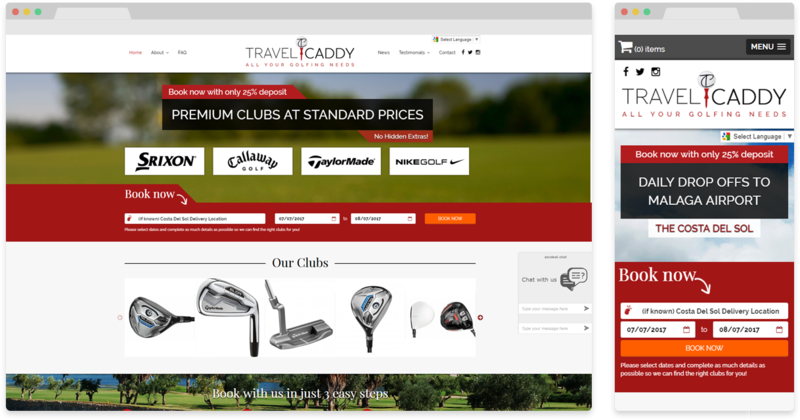 We were asked by Travel Caddy Costa del Sol to create a website that would advertise their services, give them a strong online presence and allow customers to place orders in just a few steps. The website had to be easy to manage so that products could be added, edited and removed with ease. Travel Caddy specialise in golf club hire and are situated in the beautful Costa del Sol on Spain’s south coast. Travel Caddy deliver high quality golf club and other golfing equipment to anywhere in the Costa del Sol region. They only stock high quality golf clubs such as TaylorMade, Nike, Srixon and Callaway. Unlike many other golf club hire companies that operate out of the Costa del Sol, they offer free delivery and collection. Travel Caddy however, were missing a huge amount of custom as they didn’t have any online presence. They approached us at Maxweb to broaden their reach and help them generate more sales. To achieve this we provided new branding and a new corporate identity, an E-commerce website, organic SEO and a Google Adwords campaign – the results were astonishing.